How To Write a Top Selling Kindle Book to Help Boost The Credibility of Your SEO Agency | Choice Digital | Results-driven seo and website conversion. Following on from the successful launch of “Trade Up Your Online Marketing”, which soon became a Top 15 Amazon Kindle book in the SEO and internet marketing category, I was lucky enough to be interviewed by Darryl Rosser from Lion Zeal. Lion Zeal is an SEO mastermind blog, with over 8,000 members in its Facebook group alone. Each week it features interviews with some of the biggest and brightest SEO experts and players in the industry. 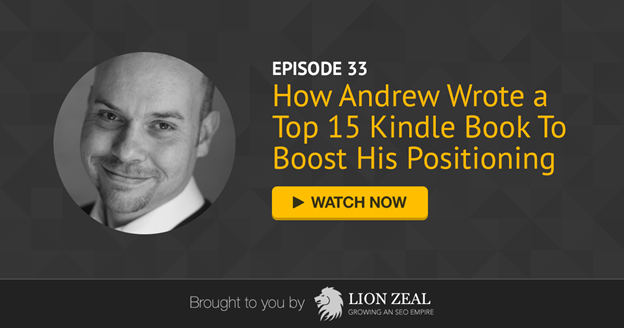 In this 60-minute interview I cover all the aspects of writing and releasing a kindle book – and most important of all – how to then use this asset to generate leads for your agency as well as better position your SEO agency in the market place. So if you’re struggling for credibility when selling your SEO services, this detailed interview reveals some very practical and winning tips. Enjoy and if you have any specific questions, please include them below.